What’s in a name? I forget who first coined the phrase, Homer, Shakespeare, Whitman, Cosby, or some anonymous advertising copywriter. Regardless who wrote it, the question still lingers. So many things are in a person’s name. In the old days one’s profession was somehow conveyed in the name. Now days, countless hours go into the selection of a name. Books galore offer ideas, rankings and meanings of every name under the sun. Today there seems to be so many things to think about when naming; carrying on family tradition, sending the right message about the person, and making sure the initials don’t spell out something strange like M.A.D. or R. A. T. Most names last a lifetime so I suppose it is good to put some time and effort into the process. I was reminded of the importance of names yesterday. 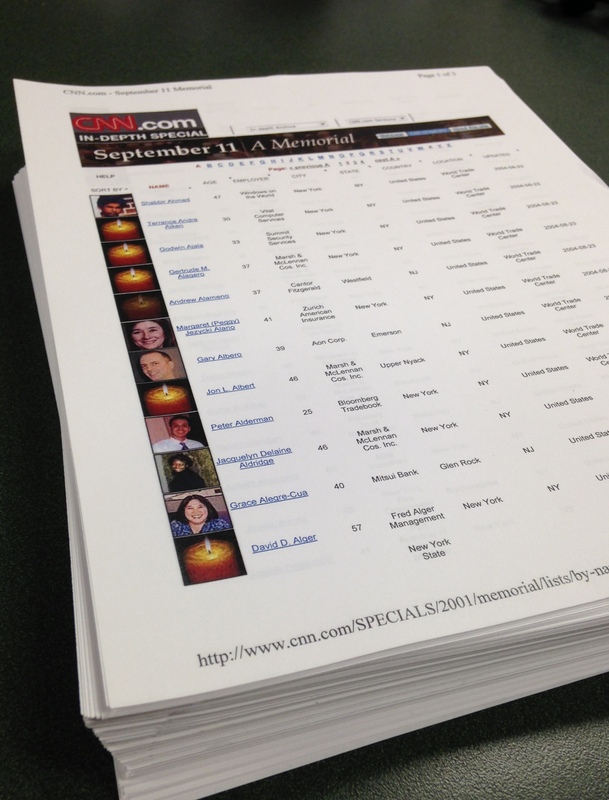 I printed out the names of the victims of the 9/11 attacks in preparation for our memorial service. Though the memory of that day still has the power to haunt, and is not too far from my consciousness, I, like most people not directly impacted have been able to move on in life. I celebrated birthdays, Christmas, Easter and marked other routine occasions during the last year. Now, however, I prepare to mark this occasion, and many of the same feelings from that day return. Immediately after the attack, the thing that brought home the scope of the tragedy was the announcement of the number of firemen killed. For me 300 plus firemen killed seemed in some way more disturbing than 3000 “casualties.” Perhaps the other number is just to high. More likely, knowing what a city and department go through when 1 fire or policeman is killed made 300 plus too hard to conceptualize. 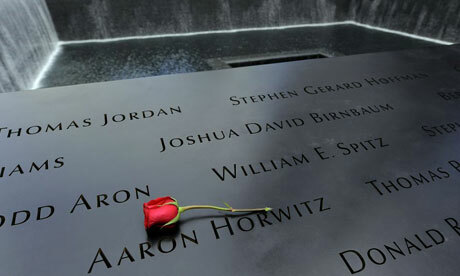 Now, a year after the attack, I had the same reaction when I saw the names, ages, and professions of the victims. Now suddenly, they were not anonymous numbers, they were people, each with loving families and friends. As I sit here I have in my lap over 100 pages of names. As I read each name, I see what is in a name, a person taken before their time, a family still mourning and missing, unanswerable questions from no longer innocent children, memories of happy times now clouded by the current time of hurt and anger. Though I did not know any of the victims by name, in seeing their names, I felt bound to them and their families. I am bound in both the pain of loss, the fear of the unknown, and the hope for a future of peace. On Wednesday September 11, we will bind ourselves with those names as we honor those who died, mourn with those left behind, and seek God’s power to not only bind us spiritually together, but to bind our individual wounds and fears in the balm of faith, community and God’s Spirit. This entry was posted in Film Shots and tagged 9/11 attack, 9/11 names, 9/11 remembrance, 9/11 victims, faith, grace, World trade center. Bookmark the permalink. Nice words. Knowing the names helps to bring the true story to life. I like reading the names on the stones in the local cemetary when I walk the dog there. Some of the head stones go back 100 years. Murmering their names under my breath is like paying a brief visit to their memory.